Will 2017 be the year of regenerative grazing? Home › LOCAL › Will 2017 be the year of regenerative grazing? POSTED January 12, 2017 12:48 p.m.
Regenerative grazing production and anti-inflammatory foods are two of the top consumer food trends for 2017, according to trend predictors for Whole Foods Market. Grass-fed beef and dairy, and pastured pork are agricultural products that may allow Crawford County farmers to cash in on both of these trends. A 2009 study, which was a joint effort between USDA and researchers at Clemson University in South Carolina, compared grain-fed beef with grass-fed beef. Results of the study demonstrated, among other things, that grass-fed beef is higher in total Omega-3 fatty acids, provides a healthier ratio of Omega-6 to Omega-3 fatty acids (1.65 vs 4.84), and is lower in the saturated fats linked with heart disease. Similar results have been obtained from comparison of conventionally produced and pasture-raised pork. One of the most important things the diet does is provide balanced amounts of Omega-3 and Omega-6 fatty acids. Most people consume an excess of Omega-6 fatty acids, which the body uses to synthesize compounds that promote inflammation. Foods such as meat and dairy from pasture-raised animals is higher in Omega-3 fatty acids, which is fuelling consumer demand for these foods. Pasturing of animals raised for meat is considered to be a regenerative system of production. Between the years of 1930 and 2012, Crawford County experienced a staggering 86 percent decrease in agricultural lands in pasture. And this trend doesn’t stop at the borders of Crawford County. In neighboring Vernon and Richland counties, agricultural lands in pasture have decreased by 81 and 85 percent in the same time frame. Most who venture into a new project need education, mentoring, and resources to help ensure their fledgling effort gets off to the best possible start. The good news is that there are lots of resources in place for farmers who are exploring adding grassfed beef or dairy, or pastured pork into their operations. One avenue would be to consider joining the Wisconsin Grass-fed Beef Cooperative. The cooperative has 162 members, and can offer an existing and growing market, advice from fellow producers, and lots of helpful pointers about what kinds of programs and resources are available. Another organization that is doing exciting work in the pasture-based production area is SW Badger Resource Conservation and Development Council (SWRC&D). Landowners in SW Wisconsin can go online to www.swbadger.org/services or call 608-348-7110 to request technical and onsite assistance. “Most farmers who try managed grazing do so because it can save them money,” according to the NRCS publication. Both start-up and maintenance costs are less than for green chopping. If you have already invested in a confinement feeding system, maintenance costs are reduced because the system is used only during the cold months. Once in operation, grazing reduces the costs of equipment, fuel, chemicals and labor. Three Crawford County grazers, Dennis Rooney, Steuben; Don Boland, Gays Mills; and Roger Dahlberg, Steuben; all seem to agree that grazing animals isn’t necessarily easier work, but it is different work. The three are dairy grazers. In addition, grass-based production causes significant changes, and these grazers would say, improvements in the economics of their operations. Dahlberg shared that for smaller farm operations, grazing is more economical. “It’s easier because the cows do more of the harvesting,” Rooney explained. “You have less costs for fuel and fertilizer – putting in corn now has become two to three times more expensive than back when I was doing it. Grazing enthusiasts would tell you that it is best for the animals too, because ruminants like cows are really designed to eat grass. “God gave cows four legs and teeth for a reason. She knows what to do – give her a chance,” said Dahlberg. “The cows are healthier because they are out in the fresh air and sunshine, getting exercise,” Rooney pointed out. The three farmers interviewed are not only farmers, but also enthusiasts who see it as their mission to help others. Don Boland is a dairy grazer farming near Seneca. He works with the Dairy Grazing Apprenticeship (DGA) program. DGA is the first accredited apprenticeship program for farming in the United States. More information about the program can be found at www.dga-national.org. Groups such as Great River Graziers and the Kickapoo Grazing Initiative offer both beginning and experienced grazers the chance to go out on pasture walks and talk to other grazers. All three experienced grazers agreed there are great programs out there to assist producers. NRCS EQIP is a program which helps grazers write their grazing plan. Farmland Preservation is a state program, which will help defray the costs of creating a nutrient management plan. Rooney, Boland and Dahlberg, along with Vance Haugen, the UW Extension Agriculture Agent for Crawford County, and David Troester, Crawford County Conservationist, are excellent resources, who can help to steer those new to grazing in the right direction. Area farmers are also beginning to explore production of pasture-based pork. The same organizations that have served as resources for farmers interested in pasture-based beef and dairy will become resources for hog farmers as well. In December of 2016, a group of about 40 interested producers gathered to discuss the idea of forming pastured pork cooperative. For more information, Mike Mueller can be reached at 608-412-0725, or by e-mail at pioneergardens@gmail.com. One organization that can be a resource in the area of pasture-based pork production is GrassWorks. GrassWorks will hold its 25th Annual GrassWorks Grazing Conference, February 2-4 at the Chula Vista Resort in Wisconsin Dells. For more information, go to http://grassworks.org/events/grazing-conference. On Saturday, Feb. 4, the conference agenda lists a workshop called ‘Pastured Pork: Are There Limits?’, which will take place from 1:30 to 3 p.m. The workshop will be led by Tom Franzen of New Hampton, Iowa. Pasturing hogs is different than grazing cattle. Boland can see that pasturing hogs, especially to serve a more lucrative niche market, may be a great fit for smaller operations. Boland’s advice for pastured pork producers is to do what you have to do to bring the animal to market weight quicker rather than slower. “If you do it too slowly, the meat from the animal isn’t going to be what you want, and that could turn consumers off,” Boland said. He emphasized that it will be important for the Co-op to set clear standards early in the game. At the kick-off meeting for the pastured pork cooperative, there was a lot of discussion about what hog breeds are best suited for pasture-based production. “Anything that isn’t white,” seemed to be the overwhelming consensus of meeting participants. Mike Mueller, who was the main organizer of the pastured pork cooperative meeting, has chosen to raise a Hereford breed pig. He cited tests that another pastured pork producer had done comparing the moisture in pork from Hereford versus pork from Berkshire pigs, and the Herefords had come out much better. Mueller directed interested producers to the Livestock Conservancy, at https://livestockconservancy.org. 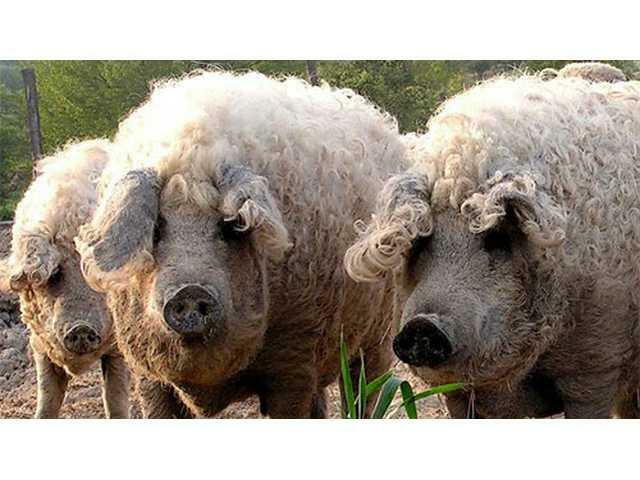 The website features a listing of heritage breeds that are in danger of becoming extinct. The mission of the Livestock Conservancy is to protect endangered livestock and poultry breeds from extinction. These rare breeds are part of America’s national heritage.